The Book Rat: Excessively Diverted: the podcast! Please give a big Austen in August welcome to Beau North & Sammi C, hosts of the podcast, Excessively Diverted! I've mentioned a lot recently that I'm getting more into podcasts and audiobooks, and the like, so obviously a Jane Austen podcast is right up my alley. Today, Sammi & Beau are going to tell us a bit about what they do, what Austen means to them, some of their favorite episodes, and where to find their podcast! Hello, Book Rat readers. 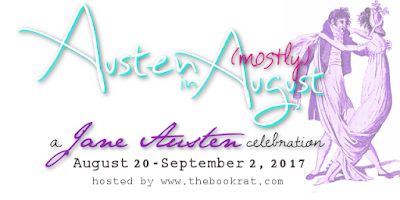 Thanks so much for letting us be part of Austen in August! As die-hard fans of Austen, it’s always a thrill to connect with fellow Janeites. If you’re not familiar with our show and what we do, here’s a short episode exclusively for the Book Rat! Excessively Diverted is hosted by Portland, Oregon’s Sammi C and Beau North. Our love of Jane Austen and Cheesy Made-for-TV Movies gave us the idea for our show, to look at modern takes on Austen’s work and discuss what we liked, what we didn’t like, what was effective, and what would Jane think? We are currently in our second season, and can be found on iTunes, Stitcher, pretty much anywhere you find podcasts. We also have a Facebook Page and you can follow us on Twitter @spockgrrl and @beaunorth! Enjoyed the bit of 'wet my whistle' with Sammi and Beau's podcast. I think these podcasts sound like a blast and I'll have to catch them after just the mini discussion in this one. Thanks for putting this one together, ladies! Don't they sound really fun? I can't wait to dig into 'em. Thanks so much for hosting us, Missy! It was the first podcast I have ever listened to. It was interesting and is an interesting concept. I can't wait to listen to this!